It’s time for another Friday Chat – and our theme this month is holiday pet peeves at the office – specifically, the holiday office party and gift exchange. A lot of offices have “mandated” attendance at various holiday office parties and gift exchanges. They can’t exactly demand you show up, but there’s certainly a lot of pressure. What happens when you decline to participate? Do you get shunned by co-workers? Put in your boss’ bad graces? What about the holiday office events makes you nuts? We’ve noticed several posts lately about ridiculous demands made on lower level employees, requiring them to bring a fancy food item, a secret Santa gift with a minimum value price tag, and so on. Don’t even get us started on assigned times to show up at the holiday office party, or restrictions on certain foods and beverages! Then again, some offices ban displays of holiday cheer completely. 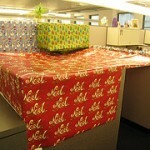 How does your office deal with the holidays? Are you overextended trying to keep up, overwhelmed with the continual chaos, or unperturbed?